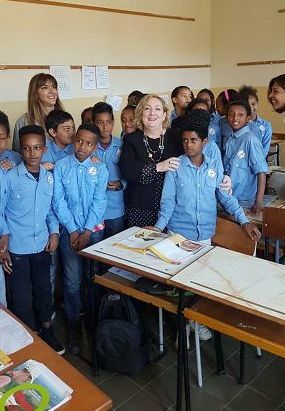 Rome, 5th December (askanews) - During the three days of the mission in Eritrea, the Deputy Minister of Foreign Affairs with responsibility for International Cooperation, Emanuela Del Re, visited the Italian school of Asmara, the largest present abroad, which has about 1,200 students. During the visit a twinning agreement was signed between the school of Asmara and the Italian school of Addis Ababa "for a cooperation, a scholastic integration", sources from the Farnesina have informed to askanews, underlining that it is the "first" agreement of this kind never signed by Italian schools abroad ". The vice minister will also visit the school in Addis Ababa, the second stage from tomorrow on her trip to the Horn of Africa. The Italian school of Asmara is "a vehicle for dialogue and understanding between the two countries at a crucial stage in the history of the Horn of Africa with opportunities for collaboration and shared development", said Del Re.